We’re extremely excited to host the 43rd Annual Members Exhibition of the Hand Bookbinders of California. We’re equally pleased that it coincides with the grand (re-)opening of the American Bookbinders Museum. 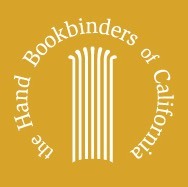 Established in 1972, the Hand Bookbinders of California is a close-knit group of hand bookbinders, with shared interests in creating and collecting fine bindings, joined together to promote hand bookbinding and related book arts and to exchange information and ideas.